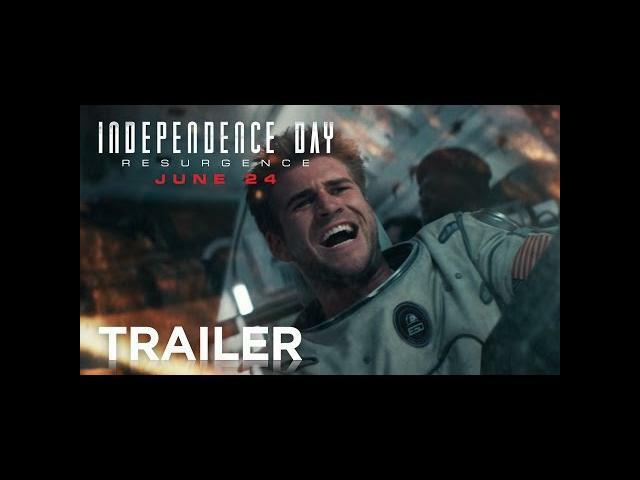 Roland Emmerich"s Independence Day: Resurgence (2016) trailer 2 arrives ahead of its June 24, 2016, release date. I am really digging this trailer and feel like this film might bring the same feelings to my children that the original provided for me. Liam Hemsworth, Jeff Goldblum, Bill Pullman, Judd Hirsch, Vivica A. Fox, Brent Spiner, Charlotte Gainsbourg, Jessie Usher, Maika Monroe, Angelababy, William Fichtner, and Sela Ward star in Independence Day: Resurgence. To help us all defend our planet, for a limited time, the original INDEPENDENCE DAY (1996) movie will be available for only $0.99, with all of Fox"s net proceeds being donated to Earth Day Network! Get your $0.99 download of ID4 here: http://bitly.com/1qWSDvc. Fans can also participate in a global #IndependenceDayLive Earth Day Watch Party, starting at 4pm PT by following #IndependenceDayLive and @IndependenceDay. We always knew they were coming back. After INDEPENDENCE DAY redefined the event movie genre, the next epic chapter delivers global spectacle on an unimaginable scale. Using recovered alien technology, the nations of Earth have collaborated on an immense defense program to protect the planet. But nothing can prepare us for the aliens" advanced and unprecedented force. Only the ingenuity of a few brave men and women can bring our world back from the brink of extinction. Check out the trailer and then head to Warof1996.com for an interactive look back on the key developments and important moments since humanity"s greatest victory, from the rebuilding of our cities to the establishment of the Moon base.